The Charles Fold singers hailed from Cincinnati Ohio and often performed with Rev. James Cleveland in the 70’s and 80’s. I’m not sure who wrote this song; I don’t think it’s a Cleveland song, but it’s wonderful and sister Rosetta Davis is sensational. I’d like this played/sung at my funeral/homecoming!! This is one of those great “sleeper” songs that sort of lulls you at the start and then builds and builds and builds…an 11 minute mini church service as it were. The song is very “Smallwoodesque” in that respect, like his “Hold On, Don’t Let Go” The soloist on this cut is Lecresia Campbell. Every summer two large, week long, gospel “conventions” are held. One was started in 1967 by Rev. James Cleveland and is sponsored by his “Gospel Music Workshop of America”. The other dates way back to 1932 when Thomas A. Dorsey, the “father of gospel music”, held the first “National Convention of Choirs and Choruses”. This cut was recorded at the 1980 NCCC convention held in New York City. Give the song a chance, it gets better and better as it goes along, especially when the entire choir gets going after the solo intro. I can’t find much about this choir online, all I know is that this song was recording in 1996. This is a great, big choir, big sound song. I love it. Oh…and just as an aside, I added the songs from the last 30 some odd posts on this blog to the Song of the Day streaming audio player. The player now has just over 1,000 songs that I’ve posted since November 12, 2015!!! Oh, while researching this album, I found one could buy it online from SKIPPY WHITE’S RECORDS in Boston. If you don’t know about this treasure and you love gospel and oldies, you should. Skippy White’s has over 100,000 45s from store stock and 25,000 LPs and 12″ singles, as well as thousands of cassettes, CDs, VHS video tapes and DVDs. Skippy White’s specializes in R&B, Blues, Soul, Gospel, Jazz and oldies from the 50’s, 60’s, 70’s and beyond. When in the Boston area, please visit our retail store located at 1971 Columbus Avenue, Egleston Square, in Boston’s Roxbury section. Skippy White’s R&B oldie radio show, “The Time Tunnel,” can be heard on line at TheBassRadio.com on Saturdays from 8:00 AM to 11:00 AM Eastern. Skippy White’s Gospel radio show, “The Gospel Train,” can be heard on line at TheBassRadio.com on Sundays from 7:00 AM to 10:00 AM Eastern. A dusty, moldy oldie from the archives…early James Cleveland music from 1972 after we started out on his own. This song was also recorded by The Chicago Mass Choir, but Steven Daniels and his Shiloh Gospel Choir do it justice as well. It doesn’t have the soaring screaming guitar on the intro that Chicago Mass has; not sure if that’s good or bad…it’s just different. A nice old school rendition of “You Should Have Been There”. Sister Emma Tucker is a new name to me, but it’s clear she’s the real deal. For fun I added a song that follows the “the Lord told me” theme from Ms. Fontella Bass of “Rescue Me” fame from 1965. Here’s a wonderful old song of the church that seems appropriate for this Father’s Day morning. I like this cut for three reasons; 1.) it doesn’t ramble on and on and on, 2.) it is performed beautifully by a college choir, and 3.) 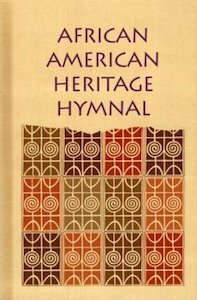 it is a selection from the great African American Heritage Hymnal, a wonderful resource for churches and individuals alike.